Did anyone get the latest call from Doug Kass? But the bulls are coming out! Yesterday, I flipped WYNN and DIS after I picked them up two weeks ago at 27ish and 55. I bought them for trades, so I treated them as such. But Deutsche Bank came out and touted these as investments. Heck they should--but they just missed some easy free money. Deutsche Bank upped their target on DIS to 39, and put a buy on WYNN with a target of 80. And in retail land, JWN's target is now 45! And speaking of retail, ANF is up 2 1/2 smackers after earnings after being touted here Monday, after Barron's touted it down the week before. I guess on Wall Street they don't follow the adage of "getting what you pay for!" And that's another risk that those bearish or short will have to contend with. 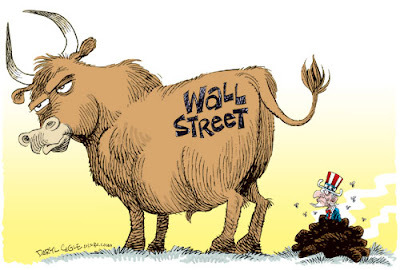 Already Wall Street (ie Goldman Sachs) has been touting the next stimulus from Washington, and now 2010 numbers for estimates are too low, so the growing chorus of the voices from the bulls will get louder. And that's where Wall Street's BS is really landing. On the taxpayer! But the bulls are making themselves heard in research. And the herd is running with it! And running away from those with the "variant" viewpoint personified by Dougie! thanks for always being so generous to post reports, provide insight and responding. hey thanks so many people in stocks don't want the information--they just want the "story"
--Waffle House built their stores perpendicular to the road so they would have less frontage--thus cheaper--and instead of doing demographic planning they just built where other fast food places had decided to build--the planning was already done! they never did the homework! The best and the brightest for the most part, are just sheep! And maybe that's why they keep trying to pull the wool over the public's eyes! were you always trading at home for your occupation? I was trading from pay phones in the 80's! It seems to me that everybody forgets what a luxury it is to have the ability to trade---and maybe that's why Wall Street has developed the algos..they still want to step in between someone else's order!